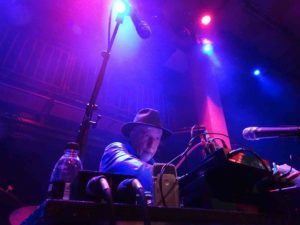 www.rhyschatham.net – Rhys Chatham music and projects. On March 16 and 17 I will be in Toulon teaching master classes at the Conservatoire Toulon Provence Méditerranée. It the largest music conservatory in France. I am composer-in-residence there this year. Toulon is a lovely city in the south of France just by the sea. I forgot how beautiful it is, the last time I spent any time there was when I first came to France with Karole Armitage, it must have been back in the late seventies. We did some performances in Châteauvallon, where there was a big dance festival every year, and the hotel was in Toulon. I had very fond memories of that time and, as it turns out, the mayor of Toulon has recently spruced the city up, even the seedier parts, and now its filled with little cafés restaurants and craft shops of all kinds. I could really get into this! Anyway, at the conservatory I’ll be giving a brass masterclass on the 16th, and the 17th will be devoted to electric guitar. The following week, I’ll give another guitar master class for the conservatory students on the 27th, and then we’ll have some student performances of some of the pieces we have been working on. The performances will be free to the public. 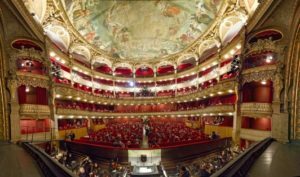 Inside the Toulon Opera. Talk about Baroque, wow! Here is Part 1 of the conference I gave in January at Conservatoire Toulon Provence Méditéranée, the largest music conservatory (in terms of number of students) in all of France. The lecture had a packed house! This is the first part of the lecture, which is about 18 minutes in length. New Music, New York Conférence – Rencontre avec Rhys Chatham: La musique dans le “downtown” new yorkais des années 70 et 80. 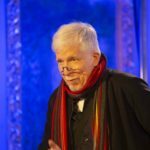 Rhys Chatham est le fondateur – et un temps directeur artistique – du programme musical de The Kitchen à Manhattan, lieu emblématique d’un certain brassage stylistique. 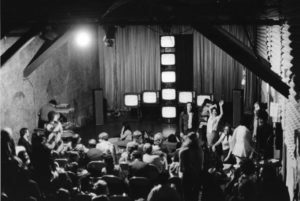 À l’occasion de cette conférence exceptionnelle, il nous parle de la scène musicale new yorkaise des années 70 et 80, du CBGBs à The Kitchen, du Max’s Kansas City à Artist’s Space en passant par The Mudd Club, du point de vue d’un compositeur et performer proche de musiciens tels que John Cage, Lydia Lunch, Laurie Anderson, James Chance ou encore Arto Lindsey. due to USA work visa issues. The concert (see below) has been rescheduled for March. An announcement on this page will be posted with the new date. 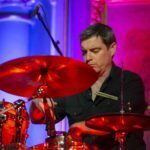 For February’s post I’ll share some photos from a recent concert with the percussionist Will Guthrie that we did at the Opera House in Toulon. Then I’ll tell you about an upcoming duo performance with the French composer Ghédalia Tarzatès that will be presented in Los Angeles at the Laxart Gallery on Friday 15 February as part of the Frieze Music events. On 26 January 2019, Conservatoire Toulon Provence Méditerranée (TMP) presented a new work of mine at the Opera de Toulon (pictured just above) entitled Talisman, which is a duo for the percussionist Will Guthrie and myself at the Opéra de Toulon. I played transverse flutes (alto and C), electric guitar and trumpet, with Will on various percussion instruments. Rhys Chatham and Ghédalia Tarzartes at Laxart. I am preparing for a duo concert in LA with Ghedalia Tazartes. It’s on Friday, 15 February at LAXART Gallery, at 8:30pm. The show is free, so first come first served! The event is part of Frieze Music. This gig features two legendary underground figures each of whom, in his own way, is a shaman of the avant-garde. If Tazartès’ earliest recordings, Diasporas (1979) and Total Eclipse of the Sun (1984) brought him into the orbit of musique concrete, he would define its outer most reaches. Composing with recorded material was the means to highly idiosyncratic ends as the mainstay of this material was tracks of him chanting. Over the years, Tazartès has emerged as a vocalist whose chants share an affinity with any and all cultures for whom it is sacred expression. A denizen of Paris since 1987, multi-instrumentalist and composer Rhys Chatham needs no introduction. His activities, from playing with La Monte Young’s Theater of Eternal Music and Tony Conrad’s Dream Syndicate to serving as The Kitchen’s first music director would define New York’s lower east side post-Minimal experimental music scene. 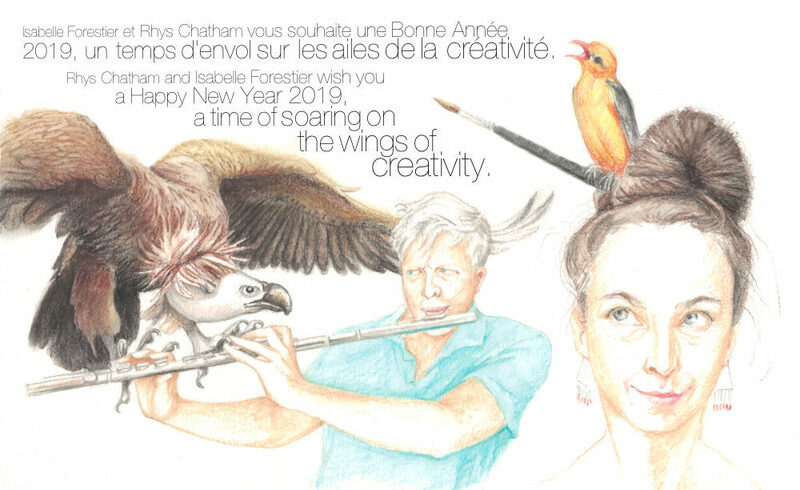 This concert is Tazartès and Chatham’s’ second meeting after their stunning debut at Les Jardins de Simones. This event is part of Frieze Music. Happy New Year 2019 to everyone! In January-March, I will be composer in residence at the big music conservatory in Toulon France, which is called Conservatoire TPM Toulon Provence Méditaerrainée. I’ll be doing a conference/talk there on Saturday, 26 January at 6 p.m. entitled “New Music, New York”, where I’ll speak about some of the material that will be included in the book I am working on. 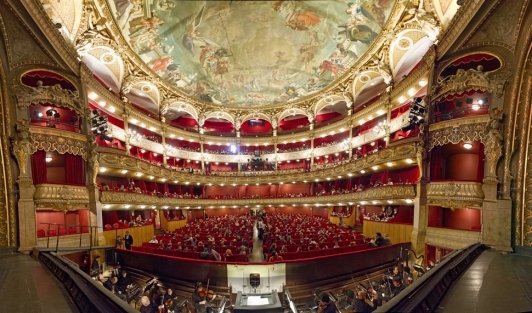 That evening, I will be presenting a new work at the Opera de Toulon (pictured just above) entitled Talisman, which is a duo for the percussionist Will Guthrie and myself at the Opéra de Toulon. I’ll be playing transverse flutes, electric guitar and trumpet, with Will on various percussion instruments. I believe that the entrance is free if tickets are reserved in advance, but I will be posting more on that as the date approaches. 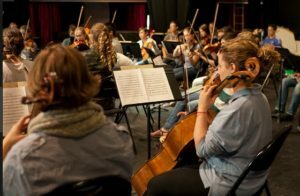 Later in the year there will be three additional concerts in the south of France presented by students of TPM. I’ll be participating in the performance either as conductor or as an instrumentalist. There will be a concert in Châteauvallon at Scène Nationale Olliques on 26 February. On Saturday 16 March, we will be playing at TPM in Toulon, and finally on Thursday, 28 March, we play in Sainte-Maxime in the Côte d’Azure, just next to Saint Tropez. That’s it for now, I’ll be back soon if more updates. 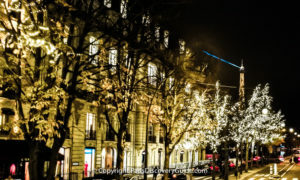 Here we are in December of 2018, the Christmas lights are going up already all around Paris, and everybody is busy thinking about presents, visiting family and the like. I’ve been busy working on a book about my early years as a concert producer at the Kitchen in New York. For more about that project, see the November entry below. I’ll be continuing this work on the book in December and probably well into the new year to come. 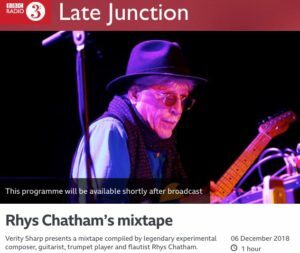 For December’s news, BBC Radio 3 has asked me to make a mixtape for their program entitled Late Night Junction. I decided to do a mix of (primarily) the music that formed me as a composer as I was growing up, so it’s quite an eclectic mix of music from Stravinsky to Bernstein, John Cage to Morton Subotnick to Maryanne Amacher to Perotin and Giles Farnaby… all the way up to Michael Nyman! I even threw in some of the rock pieces that informed my music, and as a tip of the hat to the newer generation, I included a piece by my friend Oren Ambarchi. I’ll be doing a conference/talk there on Saturday, 19 January entitled “New Music, New York”, where I’ll speak about some of the material that will be included in the book I am working on. That evening, I will be presenting a new work entitled Talisman, which is a duo for the percussionist Will Guthrie and myself at the Opéra de Toulon. I’ll be playing transverse flutes, electric guitar and trumpet, with Will on various percussion instruments. I believe that the entrance is free if tickets are reserved in advance, but I will be posting more on that as the date approaches. This is my solo performance, go here to learn more about it and for a link where you can listen to the music. There are versions of Pythagorean Dream that can be any length from 30-minutes to an hour, depending on your production needs. Rhys with Ghedalia Tazartes at “Le jardin de Simone”. Earlier in the fall I played a private concert in duo formation with Ghédalia Tazartès. We decided to work on a record together and have almost finished recording it, just one more 6-minute piece to finish, and then the album will be ready! We are lining up performances of this duo for next spring, so if you are interested in having us come to your venue, by all means contact me at rhyschathamnews@gmail.com and I’ll put you directly in touch with our agent. This is an evening length work and a brand new project and a brand new piece which we will be premiering at TPM this January. As mentioned above, Will Guthrie will be on drums and percussion and I’ll be playing transverse flutes, electric guitar and trumpet, with Will on various percussion instruments. Photographs and recordings will be available starting in February, but in the meantime, if you are interested in this project, write us! Charlemagne Palestine and I have been touring a duo, with Charlemagne on piano, voice and other instruments, and me on my usual electric guitar, flute and trumpet + electronics setup. We have a 3-CD boxed set out on Sub Rosa. 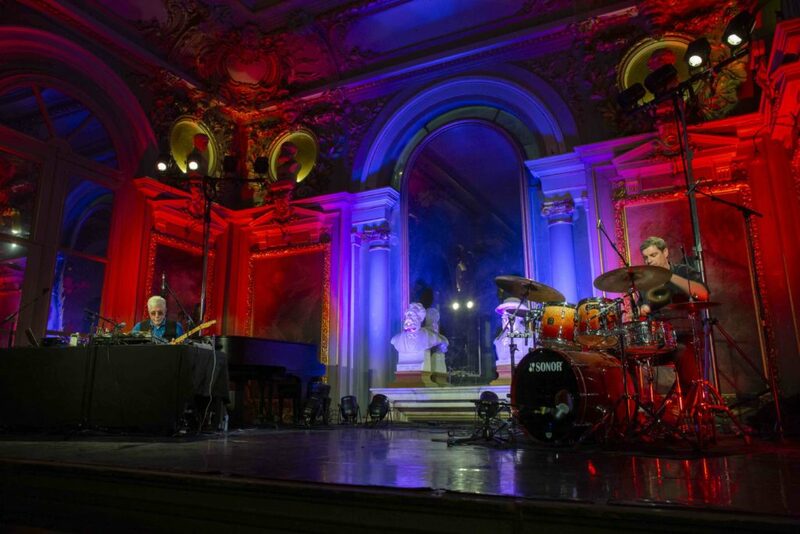 We would love to play this duo in a venue near you! You can check out the music here. As you probably know, I have a full range of pieces for 100-200 electric guitars that we’d love to perform in a venue near you. The description of those pieces can be found on this site under the heading of “Projects”. I have a new piece for 100 electric guitars that we performed last summer in La Havre, France. The performance went well, in fact it was spectacular! 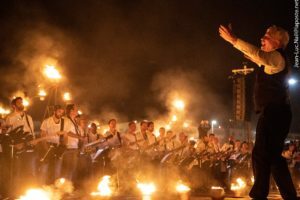 We performed the piece on the beach just by the Atlantic Ocean, and we were surrounded by bonfires, it was for the Midsummer Festival in Le Havre. They even had flames spread across the stage, it was fantastic, and speaking of flames, I almost went up in one! I got so excited conducting the piece that I didn’t watch where I was going and stepped in one of the bonfires and almost literally went up in flames. What a way to go! In any case, the piece went well, the city of Le Havre rented a hundred 100-watt Marshall amplifiers for us to go through, so there wasn’t any problem hearing us over the sound of the surf. I learned a lot through doing this new piece, so I’m re-working the score so that it can be played in an indoor location. The piece doesn’t need to be played through Marshall amplifiers, that was just an extravagance. It will work fine with normal 50-watt guitar amps and the piece doesn’t even need a sound system. I mean, who needs a sound system if you’ve got 100 guitar amps on stage?!?! In this project, I comes to the city where Guitar Trio will be presented and teach the work to local musicians in one or two workshop rehearsals. For more info on this project, go here. If you are interested in bringing any or all of these projects to a location near you please contact us! It’s been a busy period filled with composing, rehearsals and concerts so I’m happy to report that in November, I’ll be here in my studio in Paris, France and working on a number of projects. in the seventies and eighties. Video exhibition/showing at the original Kitchen in NYC on Mercer Street. I’ve been working on a book about my years at the Kitchen Center in New York, having founded its music program in 1971 and producing many concerts there throughout the 1970s. 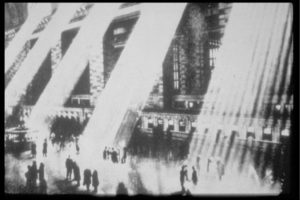 It was an exciting period that marked the beginning of the careers of such composers as Laurie Anderson, Philip Glass, Charlemagne Palestine and Steve Reich, all of whom lived in the vicinity of the same downtown area of Manhattan called Soho (short for south of Houston Street). It was a period when composers coming out of a classical European tradition were breaking away from the characteristic atonality of the music we were making back then and exploring new avenues of music making ranging from electronic and psycho-acoustic music, aleatory techniques coming out John Cage’s work and that of the Fluxus movement, to what seemed to be a reinventing of tonality within the context of music for small ensembles with what later became known as minimalism. Once tonality found its way back into the spectrum of classical music in downtown New York, composers coming out of this tradition began pushing aleatory techniques to the limit, which lead them to break away from the rigidity of notated music, inspiring some of them to experiment with improvisation. Having done this, and having realized there was already an established current of music working with improvisation – namely African-American art music, otherwise known as jazz – the respective musicians and composers began to mix things up and started playing with each other and in each other’s performance venues, until it got to a point where it was sometimes difficult to tell who was doing what! After people had just got used to the idea of downtown art music and jazz becoming amalgamated, some of the younger composers arriving on the scene were thinking, “Hey! Why don’t we do this with rock? !” And then we saw a period during the late seventies where minimalist music got amalgamated with punk rock, of all things. It was an interesting period, to say the least. The book I’m working on explores what happened from the perspective of someone coming out of a western European classical music tradition , as well as someone who had produced many of the concerts as well as playing in them. All to say I’m telling the story in my own words. 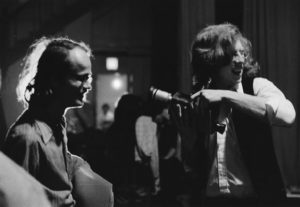 Tom Johnson & Rhys Chatham at the original Kitchen, circa 1972. So I’ll be working on that and posting some of the sketches for the book on my Facebook page. I also have some new musical projects in the works. So I’ll be working on this piece also, and will have plenty to occupy me over the next couple of months. After that, in January, I will be composer-in-residence of the music conservatory in Toulon, which evidently is the largest conservatory in France. Associated with this residency, I’ll be doing a number of conferences, workshops and concerts. I’ll be sure to post the dates as they become available. That’s it for this month. I love performing, so do be sure to write us if you’d like to have any of my projects in a venues near you! Robert Longo and I will again collaborate on the Eisenstein version of G3 (Guitar Trio). The date will be Friday, 28 September at 9pm. The performance will be at the Captain Petzel Gallery in Berlin in the context of the opening of robert’s show there, entitled “Everything Falls Apart”. 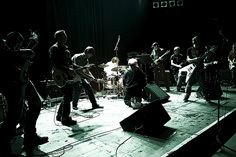 Electric guitars: Rhys Chatham, Robert Longo, Knox Chandler, Julia Reidy, Robert Engelbrecht, Alexa Disaster. Most recent performance: my solo performance of Pythagorean Dream on Saturday, 22 September 2018 at the Fort Process Festival in the UK in East Sussex. 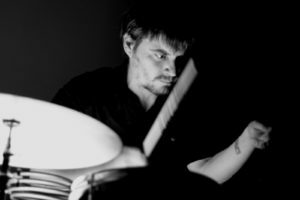 On this festival, among many wonderful acts, there was one of my favorite composers of electronic music, Ned Rush! Here is the address: Newhaven Fort, Fort Road, Newhaven, East Sussex, BN9 9DS, United Kingdom. Here is a link to the event: https://fortprocess.co.uk/rhys-chatham/. Every summer, my partner and I move our respective studios, my partner with her brushes and easels, me with my computers, Abbleton Live, Logic, Sibelius and Finale, and we go to the south of France and stay in a hamlet about 30km from Céret. We had a great summer, which I spent working on a book about my years as a music producer at the Kitchen Center in New York during the seventies. I’ve been posting individual segments of the book on my FaceBook page. In order to set a context for the issues that downtown composers were working on during the seventies I went all the way back to the birth of the twelve-tone row, tracing its development through serialism and post serialism. then moving on to early minimalism in New York, and finally recounting my adventures in Morton Subotnick’s electronic music studio at New York University, when the studio was on Bleeker Street in Manhattan. I left things there, and next week I hope to take things up again by writing about the first concerts we did at the Kitchen, when it was on Mercer Street. After returning to Paris Ghédalia Tazartès and I have been working on a duo set, which we recently performed for the first time at a private and informal concert here in Paris. I first met Ghédalia in New York, I think the last time I saw him in the flesh was at a concert at CBGBs in the late 70s, so when we first got together to work up a set, I wasn’t sure what to expect, and it was for SURE that HE didn’t know what to expect, as the last time he saw me it was with an electric guitar band at CBGBs! Happily, our first rehearsal was absolutely magical, it was as if our music were made for each other and as if we had been playing together for years. We had a wonderful performance of a new work for les 100 guitares, entitled Flamme d’Alban, which was realized on the evening of the summer soltice, 23 June 2018 in Le Havre. I will be writing more about this event shortly. We are mounting “Les 100 guitares” this June 23 in Le Havre, France. It’s going to be outside and on the beach, a highly pagan fire festival with 100 electric guitars, and HUGE bonfires! Guitaristes, participez à une aventure musicale grandiose ! The rehearsals will be in French, but I will be conducting the rehearsals, and I have a heavy anglophone accent when I speak French, so you will be able to understand me! 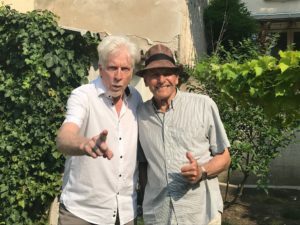 Le CEM et le GIP Un été au Havre présentent dans le cadre de l’ouverture de « Un été au Havre 2018 » « Flamme d’Alban Hefin » pour 100 guitares électriques (et plus) de Rhys Chatham le 23 juin à 23h à la plage du Havre. 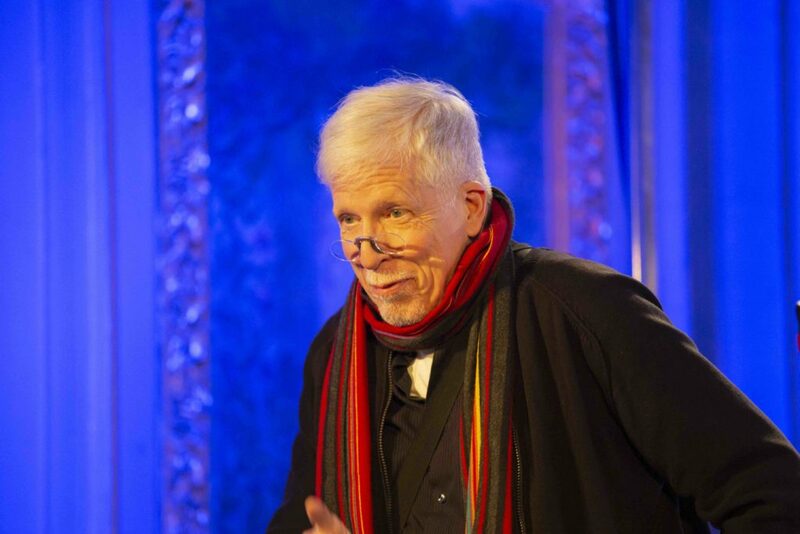 Rhys Chatham fait partie de ces compositeurs dits « minimalistes ». Au milieu des années 1970, il a travaillé aux côtés d’expérimentalistes soniques tels que Philippe Glass, La Monte Young et Steve Reich à New York. Son univers musical a été bouleversé quand il découvre le premier album éponyme des Ramones. 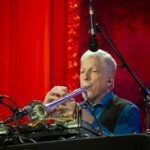 Et c’est ainsi que Rhys Chatham a réuni les deux univers musicaux qui le passionnaient au sein d’une même volonté : celle de créer des œuvres musicales à base d’expérimentation, de répétitivité et de murs de guitares. On Friday 6. 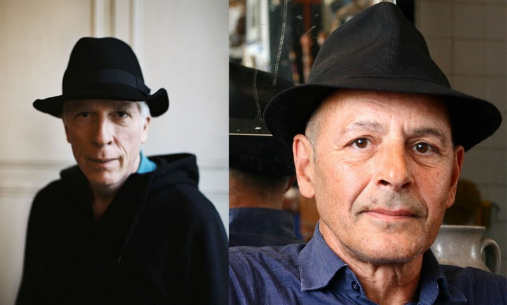 April, Rhys Chatham and Robert Longo perform together with seven other musicians Chathams composition “Guitar Trio” in the context of Robert’s exhibition: PROOF. Make a reservation now! The musicians playing are friends Rhys has known for years, as well as some new ones. 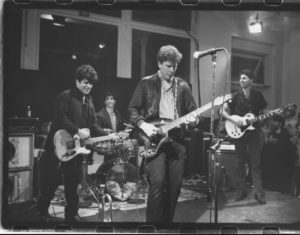 On electric guitars: Rhys Chatham, Robert Longo, Jeff Turek, Martin Richter, Wigand Koch, Lars Zwickies, and Robert Engelbrecht. On the electric bass: Matthais Schönebäumer, and on drums, Olve Strelow.